Yesterday, before we left Oslo, We did some historical sight-seeing. 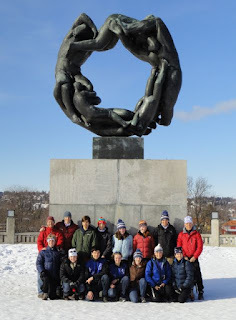 Our first stop was Vigeland Sculpture Park, a park famous for its central attraction, a series of scupltures that depict the stages of life and death. These scupltures were scuplted by Gustav Vigeland, there are 212 bronze, granite, and wraught iron sculptures in the 80 acre park. All of the sculptures werre crafted by Gustav. When we arrived coach Dennis posed a trivia question that we would have to discover while in the park. Which of the 212 sculptures was his favorite? We spent quite a while wandering the paths and terraces of the park, we had an educational moment when coach DeFrancis explained the workings of a sun dial located just in front of the monolithic sculpture of hundreds of bodies. 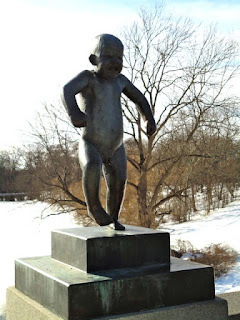 In the end we found out that Dennis’s favorite sculpture was the one of a child having a temper tantrum. When we left the park we had a great tour of Oslo that included the royal palace, and the opera house near the harbor. 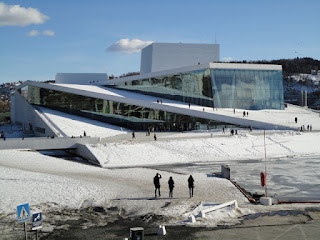 We then proceded to leave Oslo behind for Lillehammer, which for those of us who weren’t born yet was the host to the “best Olympics ever” and the 1994 winter olympics. We had pesto pasta for dinner which was a new twist on the traditional, “red” pasta sauce. This is a picture of Coach Dennis’s favorite sculpture in the whole park.